Cotton top fabric specially treated to help wick away moisture also features a cooling blend fill. The cool blend filling is a mixture of 70% polyester and 30% TENCEL(Rayon from Eucalyptus Trees). With 8 ounces per square yard it is considered a medium weight mattress pad. Please note that the packaging for this item references that it fits up to a 14 inch mattress and that was a typo. The item does in fact stretch to fit up to an 18 inch mattress. Our Infinity skirt hugs the mattress, resulting in the perfect bed topper. This item does not ship compressed - so no guessing game as to how thick it will be on the bed. We recommend washing and drying in a commercial size machine. We recommend Not using a machine with an agitator as it can cause ripping. *Please know that this product is manufactured by DOWNLITE Bedding. Only items bought from the DOWNLITE Bedding Seller are guaranteed new, unused items that are being shipped direct from the manufacture facility. If the Buy Box does not say DOWNLITE Bedding and you go through the Buy Box Seller, there is no guarantee that your item is new and unused, or that it is the same product. 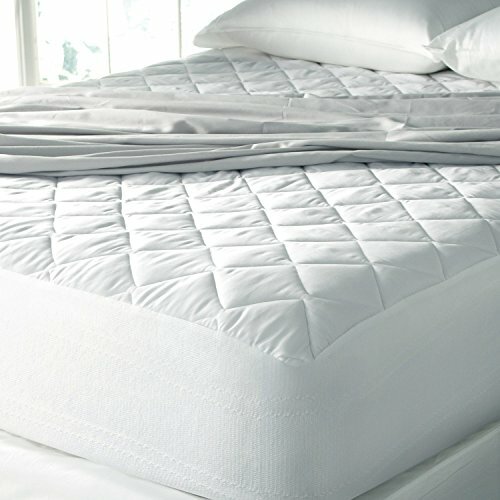 100% of DOWNLITE's Pillows, Comforters & Mattress Pads are assembled in the USA (with American and imported materials). Therefore, when purchasing do not purchase from a seller located in another country. If you have any questions about this product by Spa Luxury, contact us by completing and submitting the form below. If you are looking for a specif part number, please include it with your message. Spa Luxury Cool Touch Bamboo Plush Top Mattress Pad - Queen 60" x 80"